When you ask someone what their favorite time of the year is, most often they tell you it is Christmas. Growing up I knew it was a special time of year. It was Jesus’ birthday and though Santa Claus was the main focus for many, there was “something” in the air that trumped Santa. It was a “feeling.” We waited anxiously for the Christmas Spirit to light upon us. It never failed. The Christmas Spirit, when it hit you, enveloped your entire being. You were in love with life. Your eyes glistened and your insides felt bathed in pure love. It never failed to happen, you just didn’t know when it would – but it was always before Christmas. We also shopped differently back then. We saved our money to go shopping. We usually started a Christmas Savings Account right after the first of the year so that we would be ready. We paid cash. Sometimes we would put items on layaway. We didn’t have credit cards. Since I grew up in the city, it was customary to dress up and go downtown. Generally we rode the bus or sometimes, before the shopping centers came, we would drive downtown and park in the parking deck. All of the big department stores were decorated lavishly. The store windows beckoned you to come in. Christmas music played in the store and excitement filled the air and we loved the crowds. It was such a lovely time. As we went from store to store, we encountered people on the street who were perched on the street hoping someone would put some coins in their cup, and there was the Salvation Army kettle. We felt so privileged to be able to give, and we didn’t have much ourselves, but didn’t know it. The annual Christmas parade brought everyone out to see the floats and then shop. Santa arrived via the parade. There were Santas everywhere, but my Mother always took us to Loveman’s Department Store to see their Santa. Then there was getting the Christmas tree or putting up the artificial one. Our tradition was to put it up the day after Thanksgiving. As we shopped, we wrapped and place the hand-wrapped or store-wrapped Christmas gifts under the tree. By Christmas Day, all the bought presents, plus Santa’s delivery, were under the tree for opening. We could hardly sleep on Christmas Eve. It was the one night, other than when we were expecting the tooth fairy or the Easter Bunny that we actually didn’t have to be made to go to bed. The next morning we were up before the sun eagerly anticipating the opening of packages. This was, however, not just about presents. Just as putting money in the cup for the person on the street or the kettle, my Grandmother would cook so much we would put together a tray of all of the wonderful Christmas foods to share with those who were not able to cook or have family. Those were wonderful lessons about giving and sharing. So why all of this this about Christmas now at the end of May? It is not even Christmas in July. Remember how I said people say Christmas is their favorite time of the year? Remember how during the Christmas Season we say we wish this feeling could last all year long: it can. As we deliver “random acts of kindness,” or “pay it forward,” in some way to share good, we have received, we are taking the Spirit of Christmas with us beyond its usual season. In the Snowflake-Taylor area, the White Mountain Community Freehold has launched their “Boatload of Food Drive.” They know people give money and food for others at Christmas, but the cupboards of the food pantries still have to be filled. People need food and clothing all year long, not just at Christmas. They are extending the Spirit of Christmas. The Faith with Action group from Grace Church seeks clothing all year long. They have extended the Spirit of Christmas. The White Mountain Woman’s Club takes advantage of the summer months especially to raise money to help the local nonprofits. They are extending the Spirit of Christmas. You may be giving a shelter pet a forever home, paying someone’s utility bill, buying them a set of tires, paying their child’s tuition, dropping off dog or cat food to a local shelter, delivering a bag of groceries to someone who is struggling, or even leaving an envelope of money for someone whose life will be substantially change because of that gift. These are all acts of extending the Spirit of Christmas. Doing these things without others knowing it even make it more special. The way it makes you feel cannot be expressed in words. I challenge each of you, as I challenge myself, to bring back the Spirit of Christmas into your lives. Cut out the words at the top of this page and post them where you can see them and act on them. And that thought you had at Christmas of how wonderful it would be to have Christmas all year long will actually happen. I still have my Christmas tree up. When I feel overwhelmed by all that is pressing on me at the moment to keep up with the demands of life, I turn on the lights, and for just a few moments, I am transported back to the Christmas Season and the true meaning of Christmas. What I BELIEVE is the Spirit of Christmas is renewed in each of us each time we do something good for another… especially when it is anonymous. 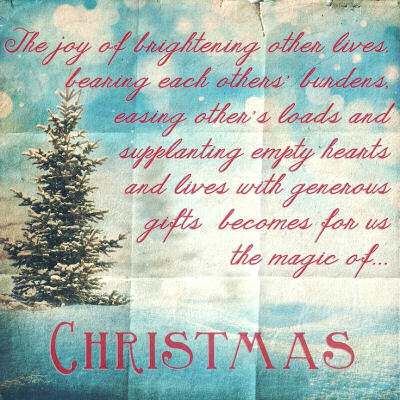 Be a Secret Santa for someone and you will experience the Spirit of Christmas every time you do it. When I was a freshman in high school, I, like many young women, was so embarrassed about my mother. If she drove us to school, we would “duck” as we were nearing the school because she would have the radio up full blast on the county station – so not “in,” in those days. It was “rock and roll” or nothing for me and my friends. I believed she did not want me to have any fun. She and my father had so many rules, I thought I might as well have entered the convent. I knew one thing for sure in those years, I would never be like my mother. I had heard my mother say many times that she never wanted to be like her mother, but one day she said she woke up, looked in the mirror and out from beneath her sleeves, came her mother’s arms. I really didn’t understand what she meant by that statement, but I do today. Like most grown women, we reach the point where one day we magically acknowledge that our mother is our best friend. When that occurred to me, she and I did everything together. We talked several times a day, went shopping together and talked about everything. I believe my siblings were somewhat jealous, but I was the oldest. I could see how much wisdom she actually possessed. I could see and feel the unconditional love she had for all of us kids. I suddenly had an insight into all the sacrifices she made over the years, as well as those she was still making. My mother was not the favorite child of her mother. She was born at home, the next to the last child, a total of eight children. The doctor accidentally stuck his finger in her eye and as a result, she had what they called “lazy eye.” She had to have surgery before she started first grade, causing her to start school late, with a patch on her eye. Kids can be so cruel and with the fun they made of her and her patch, she learned to take up for herself and be her own person. Little boys, I am told, did not mess with her. I can say she carried this with her into her adult life, at least the years I was old enough to be aware. I had heard stories growing up. No one ever walked over my mother; no one. She was always fair but if you crossed her, you lost. We knew if we were right she was behind us, but if we were wrong, we were in some kind of big trouble. My mother was a hard worker, followed all the rules, was the dutiful child, yet she had her own crosses to bear alone. She spoke her mind and you always knew where you stood with her. People either loved or hated her – no in between. She was a force to be reckoned with. There were four of us kids. I am the oldest, then my sister Rebecca who, like my mother, passed away last year. Next is my sister Beverly and then my brother David. We each had our own relationship with our mother but I can truly say for me, she and I had some incredible times together and shared confidences that are forever sealed in my heart. She and I shopped many sales together. We went to seminars and worked on healing our lives. We quit smoking together, we grieved the death of my husband together. And oh how I wish we could have done even more together. For eight years my precious mother battled cancer bravely. We talked every day on the phone – I can count the times we missed in those eight years on one hand. On February 27, 2014, we talked for the last time. On February 28 she was too weak to talk. On March 1, my Sister called and said Hospice had given her until Monday. Twenty minutes later, my Sister-in-law called and said she was gone. Several times my mother and I acknowledged that there was nothing left for us to say to one another; all was good between us. The I love yous and thank yous had all been said again and again. Now it was just heart-to-heart, no more words necessary. My mother dedicated her body to science. An hour after she made her transition, they picked up her frail little cancer ridden body and transported her to the University of Alabama School of Medicine. Her last sacrifice – letting medical students learn from her body. I still reach for the phone and want to dial her number and talk to her. I speak to her out loud almost daily, especially when I would like to have her guide me in some issue going on in my life. I say, “Mother, where are you?” Oh, how I miss my mother. You think she is going to be around forever. She is the one who loved me truly unconditionally. My grandmother, my mother’s mother, use to say, “A mother will follow her son to the gallows and beg for his body.” That is how mothers love their children. The first Mother’s Day she was gone was last year. 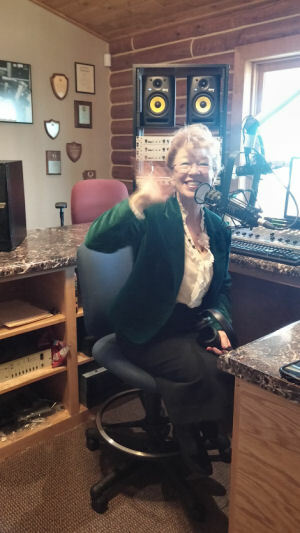 I did a radio show with mothers and a Hospice Chaplain. The ladies who had lost their mothers had lost them years ago, but tears flowed as they talked about the woman who loved them and birthed them. I wear the pearls that were hers that my father brought back to her from Korea. I am getting her dinner ring enlarged so I can wear it too. I have her prayer books and other mementos that are so precious to me. You just do not get over losing your mother. The pain subsides but you still miss her. One of the ladies I interviewed talked about how hard Mother’s Day is each year when you go to church or out to eat and you do not have your mother any more. I always spent hours looking for that right card to send her. My sister packed them up and sent them to me. My mother kept all of my cards, notes, pictures and gifts I sent her. It is comforting to know they were treasures to her. This will be Mother’s Day No. 2 without her. The last year of my life without my mother has been hard. I think of her every single day. I pray my mother feels/knows how much I miss her. I am so grateful she was “My Mother.” I am so grateful for the lessons she gifted me, good and bad. My mother and dad were married just short of 68 years. Each Sunday I talk to my dad and treasure that connection, which is a connection also to my mother. The umbilical cord from our mother is cut when we are born, but spiritually, it remains. My mother has been gone now 1 year, 2 months and 10 days. I marvel at how she handled life. 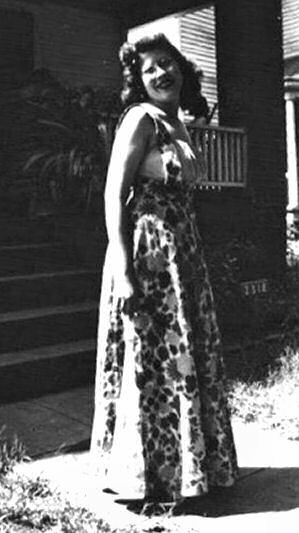 She was a strong southern woman with class and moxy, to say the least. Not just today, Mother’s Day, do I miss and think of her, but every single day of my life. She holds a permanent place in my heart which cannot be replaced by another. This Mother’s Day I say, “Like you, Mother, I look into the mirror and see that out from beneath my sleeves, come my mother’s arms. I pray that as I spend my final years paving my way to Heaven’s Gates that I exhibit the grace and equanimity that you showed us in your final years. That young girl who didn’t want to be like her mother proudly tries to emulate her today. Happy Mother’s Day. I “BELIEVE” you know that I HONOR you.